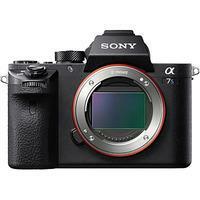 The Sony Alpha A7S Mark II is a replacement to the A7S, with enhanced video functionality, a faster AF system and extraordinary low-light capabilities that will appeal both to photographers and video specialists. In addition to internal 4K video recording with full pixel readout, the A7S MK II also offers S-Gamut3.Cine/S-Log3, new Gamma Assist Display, enhanced Zebra Function, Full HD at 120fps and 4x/5x slow motion recording. At the heart of the a7S MK II is a full-frame 12.2-megapixel image sensor and BIONZ X image processing engine that work in tandem to deliver 5-axis Image Stabilisation and an outstanding sensitivity range of ISO 50-409,600 to facilitate even greater shooting control in challenging lighting conditions. Battery NP-FW50, AC Adaptor, Battery Charger BC-VW1, Cable Protector, Shoulder Strap, Body cap, Accessory shoe cap, Eyepiece cup and Micro USB cable.